AEM digital racing dash display gets 40% faster. 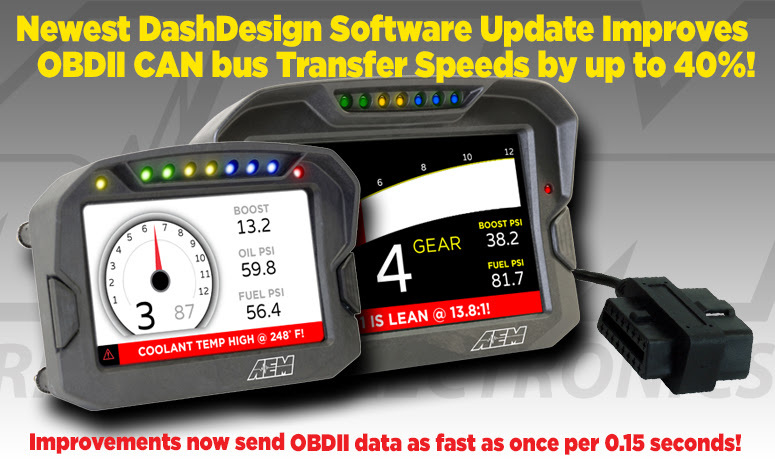 Newest AEM DashDesign Software Update Improves OBDII CAN bus Transfer Speeds by up to 40%! AEM’s latest digital racing dash display software update improves the transfer speeds of data from OBDII CAN bus devices to CD-5 Carbon and CD-7 Carbon Digital Dash Displays by up to 40%! These improved speeds provide the ultimate user experience for 2008-up track day vehicles and street cars using OEM ECUs that are connected to a CD Carbon Digital Dash Display with AEM’s OBDII CAN Plug & Play Adapter Harness (PN 30-2217). CD Carbon Digital Displays combine direct-sunlight readability, multi-page programmability, unlimited alarms and warnings and include optional GPS and data logging to deliver track mapping, lap times and data that can improve vehicle setup and driver skill while allowing you to See Everything. AEM engineers performed other minor improvements and bug fixes to ensure DashDesign is easier than ever to use. click here for a copy of DashDesign 1.04.08 release notes>, and click here to download the latest version of DashDesign Software>! CD-5 Carbon and CD-7 Carbon color digital displays feature super-bright, high-contrast, sunlight readable five-inch and seven-inch screens surrounded by tough, lightweight carbon fiber composite enclosures that make them the lightest graphical dash displays in their respective categories. Both displays have an integrated glare diffuser and shade hood for readability in the brightest daylight conditions. They are designed to accept channels from CAN bus connections and do not include analog inputs. Seven ultra-bright programmable LEDs span the top of the display housings for RPM and shift light indication. Two large buttons are included on the face of the display, providing easy page changing and memory resetting, even with driving gloves on. Two additional programmable LEDs are located above the toggle buttons on the sides of the housings. AEM’s OBDII Plug & Play Adapter harness (PN 30-2217) makes CD Carbon Dash Displays the perfect track day displays for racers with 2008-up vehicles that have a stock/reflashed ECU. Using the OBDII Plug & Play Adapter Cable, the dashes can display available channels from a vehicle’s OBD port. Combine a logging version of the dash with the factory channels and our optional integrated GPS feature, and racers have everything they need to create track maps, view lap times and log all incoming channels! The CD-5 Carbon’s and CD-7 Carbon’s harnesses include two independent CAN bus inputs, so virtually any device with a CAN output can be added. The CD Carbon digital dashes are validated to support hundreds of 3rd party devices, in addition to AEMnet CAN-enabled products like our Infnity and Series 2 ECUs, 22 Channel CAN Sensor Module and our Vehicle Dynamics Module (PN 30-2206), all of which can be piggybacked together using a pigtail-style DTM connector. Our 22 Channel CAN Sensor Module (PN 30-2212) converts analog, digital and frequency inputs into an AEMnet CAN bus signal that can be transmitted to the CD Carbon Digital Dashes, eliminating the need for a CAN-based EFI system or device. The 22 Channel CAN Sensor Module has everything that users need to get data onto the Dash in a carbureted vehicle, including tachometer and fuel level, wheel speeds for MPH, and pressure/temp sensors. Users can daisy-chain two of the Modules together, which is ideal for enthusiasts who have a logging CD Dash and want to expand their logging capabilities. Our Polaris RZR Plug & Play Adapter Kit (PN 30-2216 for CD-7 aluminum enclosure/PN 30-2219 for CD-5 Carbon & CD-7 Carbon digital dashes) includes RZR specific screen layouts designed to get you out riding with virtually no installation or setup time! This harness provides a true plug & play connection from the Dashes to the Polaris RZR’s factory CAN bus through the diagnostics port, and receives all available channels from the factory CAN bus system. With a full-color daylight-readable screen, four main pages, a dedicated alarm page, included templates for quick startup and more, our CD Carbon PNP RZR Adapter Kit is the perfect solution for RZR owners who want to SEE EVERYTHING in the dunes and on the trail. Seven LED RPM/shift light indicators on top of the housing are fully reconfigurable and programmable to suit user needs as indicator lights, warning lights, etc. Advanced Engine Management’s performance electronics are Engineered to Outperform. The company designs, manufactures and assembles engine management systems, digital dash displays, wideband air/fuel systems, water/methanol injection systems, data loggers, performance gauges, boost controllers, performance sensors, ignition components, fuel delivery components and adjustable cam gears at its corporate headquarters in Hawthorne, CA.